"For people who love avocado. This yummy milkshake is very creamy and smooth." 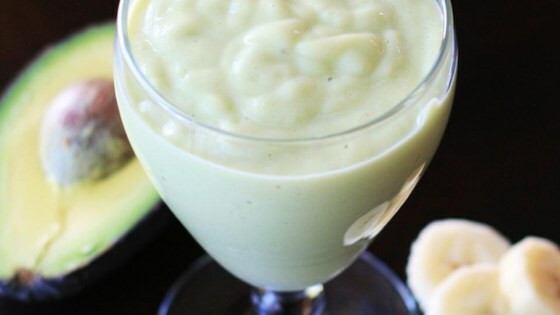 Blend milk, avocado, banana, and honey together in a blender until smooth. It's okay. Great for St. Patty's Day. Quick and tasty! If including a banana (frozen makes milkshake nice and cold), be sure to adjust the amount of honey ... riper banana = less honey. Thanks for the recipe Sugar High. i added a few blueberries, will be making this again beautiful. Simple and fantastic, thanks for sharing. Also, delicious with almond milk. This is a great 'Run out of the door' kind of shake!! I've made it more times than I can count, I use either Cashew or Coconut milk unsweetened and no honey and still enjoy! !